Disney has released another Toy Story Land construction update with the reveal of the Slinky Dog Roller Coaster Trains. 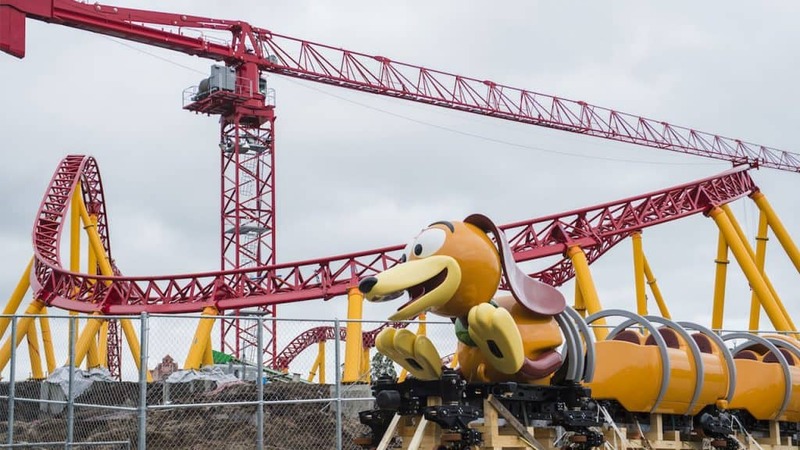 Slinky Dog Dash is a family coaster that will debut as one of the land’s two new attractions when Toy Story Lands opens in summer 2018. 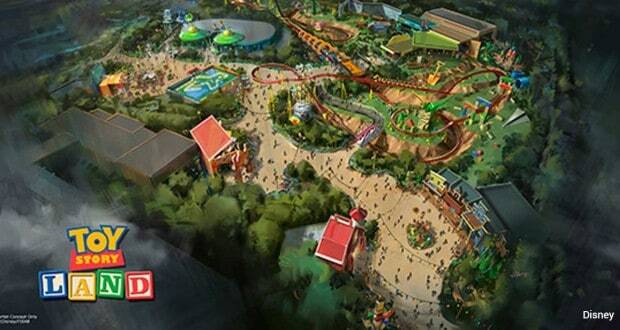 We are very excited for the addition of this land, especially another roller coaster! Check out all the details below! Check out the video below for a look at the warm welcome the new ride vehicle received. 5) High quality entertainment – Disney’s Hollywood Studios is home to quite a few entertainment experiences that are family friendly and full of Disney magic. One of my favorites is Beauty and the Beast – Live on Stage. The performers, set and music are all of incredible caliber, and that’s coming from someone who has seen her fair share of shows on Broadway! If you love the film, then this is definitely a must-see during your time in the park. Some of the other entertainment offerings that are worth mentioning are the Frozen Sing-A-Long, Indiana Jones Stunt Spectacular and Fantasmic! All of these are bound to delight and dazzle your entire family, so be sure to check them out next time you’re in Studios. 4) Star Wars – If you are a Star Wars fan, the amount of Star Wars in the park is sure to be satisfying. From character greetings to merchandise and, of course, an attraction, Star Wars has found a permanent home in Hollywood Studios and it’s only going to increase in size. The nightly fireworks spectacular is even themed to Star Wars—and it’s an impressive display. Even if you’re not a fan of the franchise, you can’t help but want to meet Chewbacca and take a flight on Star Tours. There are also a few entertainment offerings as well: the March of the First Order and Star Wars: A Galaxy Far, Far Away. 3) Excellent dining – I love getting to try out new restaurants around Disney property, and Hollywood Studios has some of the best. If character dining is your thing, Hollywood & Vine has breakfast and lunch buffets with Disney Junior characters and a dinner buffet with Minnie and pals. I’ve heard that the food is good and the interactions are great, so this is a good choice for families. If you want something with a fun atmosphere, both Sci-Fi Dine In and 50’s Prime Time Café are unique dining experiences with delicious food. My family and I have been to 50’s Prime Time Café many times if that’s any indication of how good it is! And, if you’re looking for something a little classier, Mama Melrose’s and The Hollywood Brown Derby are excellent choices. Though a bit pricier, the food is to die for and the atmosphere is great for both families and those looking for something a little more romantic. 2) Fun attractions – If a theme park has a good lineup of attractions, I’m hooked. Hollywood Studios has some of the best rides across all of Walt Disney World, in my opinion. The Tower of Terror is, probably, one of the reasons that people go to Hollywood Studios in the first place. It’s a classic attraction with a killer storyline and appeals to all ages. Then you have Rock ‘N’ Roller Coaster, which is also popular with guests, and Toy Story Mania, which hasn’t slowed down in popularity since its opening in 2008. These three attractions alone are the reasons I go to Hollywood Studios as often as I do. They are fun, unique and perfectly themed. 1) Expansions – The best thing about Hollywood Studios is the fact that it’s in the process of expanding. Even though that means we are without several attractions right now, we know that in a few years we will have two incredible lands with many new attractions and dining locations. Hollywood Studios needed this overhaul badly, and as the direction of the park shifts from one set of ideas to another, I think it’s safe to say that we will end up being impressed and happy with the end result. Hollywood Studios is in a transitional period, but that doesn’t mean it doesn’t have anything to offer in the meantime. With its lineup of exciting attractions, immersive entertainment offerings and fun dining locations, there is plenty to see and do. Don’t skip out on spending a day in the park during your next trip! The Best Disney Packing List Ever! Have You Had These 10 Incomparable Experiences at Disney? After his 1st trip to Disney World when he was 5 years old, Disney Fanatic has been hooked on all things Disney ever since!